I’ll never forget the charming little threadbare street vendor on the dusty corner of Presa Las Virgenes and Paseo de la Reforma where we would regularly purchase our Elotes at the end of a frantic day’s shoot. 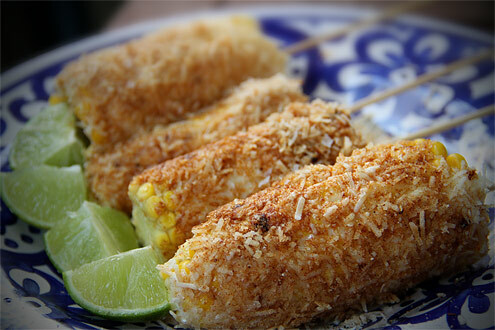 We’d take these tasty corn ‘popsicles’ up to the terracotta rooftops of our rambling majestic casa and accompanied by an iced bottle of Medelo, watch the sun as it set dramatically over the picturesque slums of downtown Mexico City. Actually we’ve never been to Mexico or a ‘shoot’, but it seems in all likelihood plausible to imagine that this might seemingly be quite like the sort of thing we could have possibly done, perhaps. 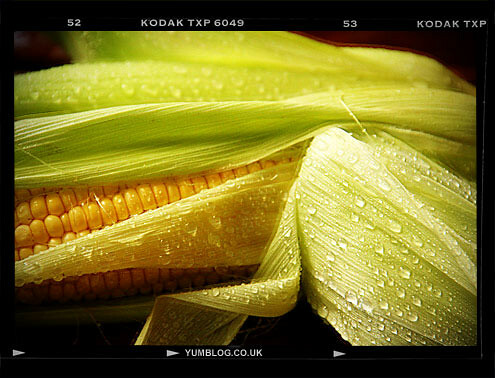 Strip down your corn cobs (assuming they are leaf-clad) and cook in boiling salted water for 10 minutes, or until done. Meanwhile mix together the mayonnaise with half the lime juice and spread on a plate. Mix together the cheese, paprika and chilli and spread out on another plate. When the sweetcorn is ready, remove from the water, dry with a clean tea towel and ‘skewer with a skewer’. First roll your cobs in the mayonnaise and then the cheese ensuring they are coated thoroughly. Sprinkle with a little more sea salt and paprika. Serve immediately with a wedge of lime. Verdict: There was never really any doubt that these were going to be anything other than delicious. It’s dirty food, but it’s good food. Entertainment: ‘Celebrity Masterchef’, episode 2. Little has changed (Brilliant!) although Gregg and John are no longer allowed to say a dish needs more salt… they have to say it needs more ‘seasoning’. No, really.